Always attention to detail, technical skills, passion in our work and great attention to customer needs are the strengths that have allowed us to excel in the field of sale of Airbrush Infinity TWO IN ONE 0.15 - 0.40 Harder & Steenbeck. Consultando il catalogo di Aerografando you will immediately notice how vast it is and how diversified the model range is Infinity, you will find the best Airbrush Infinity TWO IN ONE 0.15 - 0.40 Harder & Steenbeck offers at the best prices on all Airbrush Infinity TWO IN ONE 0.15 - 0.40 Harder & Steenbeck of the brands Harder & Steenbeck. The High-end airbrush instrument for professional artists not only sets new standards in design, it also offers intelligent functions and ergonomic excellence. The Quick Fix, with its engraved scale, allows even more accurate paint-flow control. The lever resistance can be individually varied. The open needle cap ensures permanent control of the needle tip. The Infinity solo is supplied with a 0.15 mm self-centring socket-type nozzle. The 2in1 version also includes an additional 0.4 mm nozzle and larger paint cup. Read the reviews of our customers on Airbrush Infinity TWO IN ONE 0.15 - 0.40 Harder & Steenbeck of the category Infinity. Review Airbrush Infinity TWO IN ONE 0.15 - 0.40 Harder & Steenbeck of the brand Harder & Steenbeck. 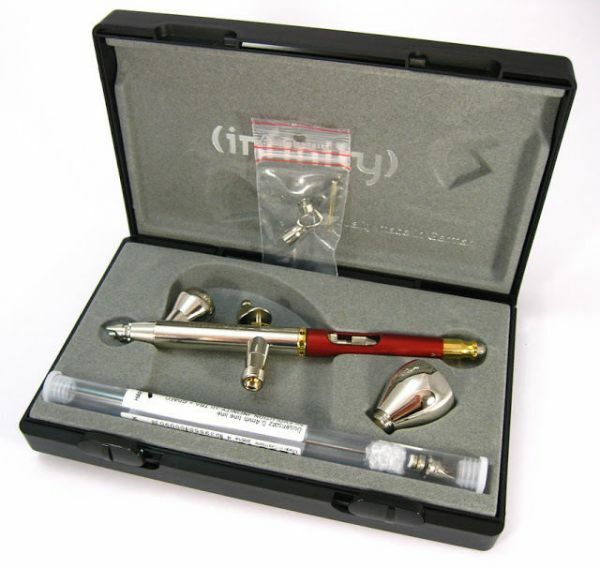 Trust in the quality and professionalism of Aerografando on the sale of Airbrush Infinity TWO IN ONE 0.15 - 0.40 Harder & Steenbeck, only from us you will find the best prices. You want to have more details on Airbrush Infinity TWO IN ONE 0.15 - 0.40 Harder & Steenbeck 126543 or more generally on ours Infinity? You are looking for a Infinity but do not you find it in the catalog? Staff of Aerografando will answer all your requests.